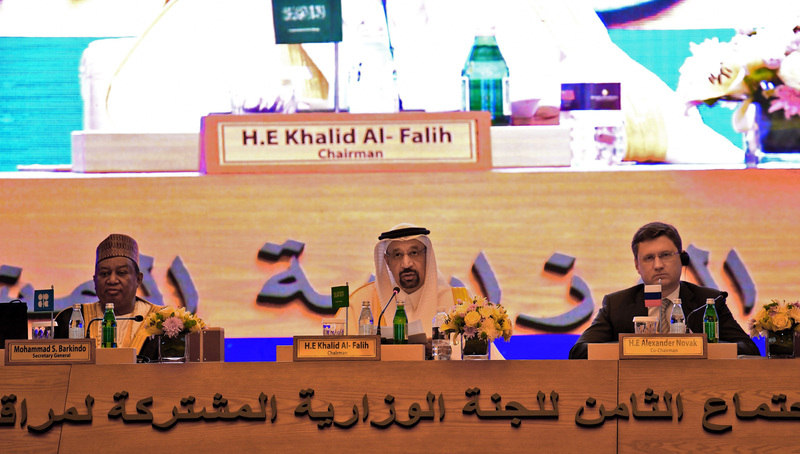 Will the price-stabilizing OPEC+ agreement last? In August, global oil production reached 100 million barrels a day for the first time ever. U.S. shale accounted for the largest share of growth, with increases in Saudi and Iraqi production major factors as well. Breakthroughs in the production and transportation of hydrocarbons have ushered in a new era in the global petroleum market. In only a decade, the U.S. shale boom has shifted the balance of power in the oil market from OPEC to non-OPEC producers. Meanwhile, the advent of and further improvements in liquefied natural gas (LNG) technology have transformed the gas market by allowing suppliers to overcome the restraints of the traditional mode of transport—pipelines. After watching the U.S. shale industry double down on technology to remain profitable in the face of plummeting oil prices, countries that had been major competitors came together to try to push prices back up—notably Saudi Arabia and Russia. The result was that in 2016, OPEC members abandoned their failed tactic of trying to protect their market share by continuing to pump oil when prices were falling. In a first, the cartel signed an agreement with a group of Russian-led non-OPEC countries to curb production—a move that helped boost global prices. When the deal worked, those who signed the ROPEC—or Russia + OPEC—agreement extended it for another two years. Both geopolitical and macroeconomic considerations have figured in OPEC's decision to stick with the lower production rates the deal requires. A key geopolitical consideration is President Donald Trump’s opposition to high oil prices, which would hurt him and his Republican colleagues among American voters. He railed against policies that would raise prices in a series of tweets before OPEC’s late October meeting in Algeria. Both Washington and Riyadh also want to prevent Iran, which is vying with Saudi Arabia to be the dominant force in the Middle East, from benefitting from high oil prices. A macroeconomic consideration that played an important role in OPEC’s decision to stick with its production curbs is that high prices could lead China and other Asian nations to import less oil, and even prompt other producers to start petroleum projects of their own that would otherwise not be feasible. Both Saudi and Russian energy officials see a price of $70 to $80 a barrel as an optimal range—high enough to maintain current oil-import demand but low enough to prevent other countries from developing production projects. On Oct. 23, OPEC announced that it would continue limiting production despite shrinking global supply, better than expected growth in Chinese demand, and market volatility sparked by the U.S.-China trade war. The decision pushed the price of oil over $80 a barrel for the first time since 2014. Another factor in the oil supply outlook is that the second wave of U.S. sanctions against Iran will go into effect on Nov. 4. Making sure that they don’t cross the U.S., sizable buyers of Iranian crude, including South Korea and India, have either stopped buying it altogether or have cut back their purchases. In contrast, the largest importer of Iranian crude, China, has vowed to continue buying it while working with the EU and Russia to mount a common front against the sanctions. The EU has already said that it plans to create a non-dollar-denominated financial instrument that its companies can use to trade with Iran. Iran’s customers face other types of obstacles as well, such as restrained access to oil carriers and insurance. This means that cuts in Iranian imports are likely to deepen. In addition, Trump’s harsh rhetoric against Venezuela suggests that Washington will slap additional sanctions on the economically beleaguered state, further lowering global oil supply. Taken together, these developments presage more drops in global supply, which Saudi Arabia, the only producer with significant spare capacity, will need to bridge to keep prices from soaring. Because ramping up production takes time, the Saudis will have to tap into their reserves for a while. Some oil experts even question whether Saudi Arabia has enough spare potential to increase its production to meet an expected global shortfall of 2 million barrels a day. Meanwhile, the battle for the still-expanding Chinese market is becoming fierce. Rising production in such non-OPEC countries as the U.S. and Brazil is expected to be a challenge for Saudi Arabia and other Persian Gulf states. Underscoring that concern, Russia’s state-owned oil and gas conglomerate Rosneft surpassed Saudi Aramco as the largest supplier of crude to China in 2017. One reason was that its closer proximity to China made its crude more competitive. Another was that the ROPEC agreement limiting Saudi production reduced the amount it could sell to China. Although the current oil-market landscape might seem beneficial to the Gulf states, it will be difficult to sustain. For one thing, while the OPEC+ arrangement has stabilized oil markets, it remains to be seen whether it can last. Saudi Crown Prince Mohammed bin Salman wants to institutionalize the arrangement, while Moscow does not. This is largely because OPEC+ involves binding quotas. Russia wants OPEC to adopt the approach of the Gas Exporting Countries Forum, whose members’ production policies do not feature quotas. As Washington’s standoff with Tehran continues, and anti-Russian sentiment in Congress leads to stiffer sanctions against Moscow, Riyadh and its allies will find it more challenging to balance U.S.-Russia relations. This, in turn, will make it harder to preserve the OPEC+ agreement.